More than 100 years have passed since the first lectin ricin was discovered. Since then, a wide variety of lectins (lect means “select” in Latin) have been isolated from plants, animals, fungi, bacteria, as well as viruses, and their structures and properties have been characterized. At present, as many as 48 protein scaffolds have been identified as functional lectins from the viewpoint of three-dimensional structures as described in this chapter. In this chapter, representative 53 lectins are selected, and their major properties that include hemagglutinating activity, mitogen activity, blood group specificity, molecular weight, metal requirement, and sugar specificities are summarized as a comprehensive table. 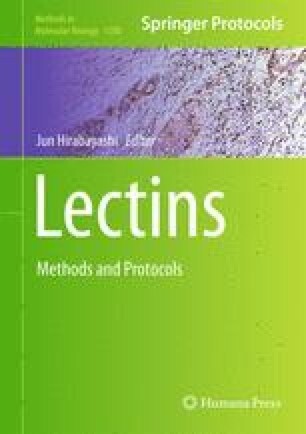 The list will provide a practically useful, comprehensive list for not only experienced lectin users but also many other non-expert researchers, who are not familiar to lectins and, therefore, have no access to advanced lectin biotechnologies described in other chapters.